I have seen many people telling very proudly that they use Apple’s iPhone and I can tell that the proudness is worth the phone. Every time Apple releases its new product people around the globe go crazy. Many of them upgrade their Apple phones keeping faith in the company. The iPhones always amaze us with its all features added. The camera specifications are always updated in every update. We cannot tell how good the camera is until we go for a shot. The main difference between iPhone’s camera and others is iPhone goes for every minute detail to be observed by camera’s sensors so that the picture stays alive without any photo editing tool to be used for the desired shot. Now the whole buzz is about the all-new iPhone 8, iPhone 8 plus and iPhone X. Here I am going to talk about the iPhone 8, iPhone 8 plus specifications and I will try to give some review too about the most awaited phones. The specifications of the two models differ in some places and I will give the details if there are some things more in the other model. Apart from that if no specification is given specifically then understand that both the iPhone’s possess same specs in that particular field. The iPhone 8 looks beautiful with completely glass-covered design front and back. Well, you may be afraid because glasses tend to break easily but for your relief, Apple gives its word that the glass is 50 percent stronger than it was ever before. The display size is 4.7-inch RETINA HD. It comes with multi-touch and IPS technology. The resolution is 1334-750 pixel at 326 ppi with a contrast ratio of 1400:1. It comes with true tone display and 3D touch. It also has a finger-print resistant oleophobic coating. Touch ID comes with fingerprint sensor inbuilt with the Home button. The true tone technology helps in giving the best shots by adjusting the white balance around the subject automatically. Dual domain pixel is also an added advantage as it makes possible to get a great view from almost any angle. ALSO READ: WHY SAMSUNG GALAXY S8 IS WORTHY TO BE FLAGSHIP OF THE COMPANY? This one comes with Retina HD display with 5.5 inches long widescreen LCD Multi-touch display with IPS technology. The resolution takes another leap by taking the resolution to 1920-by-1080-pixel at 401 ppi and with 1300:1 contrast ratio typically. This handset comes with True Tone display with a wide color display with 3D touch and 625 cd/m2 max brightness typically. The height of the phone is 5.45 inches with a width of 2.65 inches and the depth of 0.29 inch that is 7.3mm and it weighs around 148 grams. The height of the phone is 6.24 inches with a width of 3.07 inches and the depth of 0.30 inch that is 7.5 mm and it weighs around 202 grams. The new iPhone comes with the best precision engineered water and dust resistant. It is perfectly manufactured in terms of these aspects with the all newly added high durable glass. It is rated IP67 under IEC standard 60529. ALSO READ: 5 PHONES WHICH NEEDS A COMEBACK..! It comes with 12 MP camera f/1.8 aperture and digital zoom up to 5X. Apples camera is the best around. Apple’s silicon team working on the camera puts more effect on making the camera still the best from its competitors. The sensors play a major role in the camera as they make sure the clarity and the reality comes naturally without any photo editing tool. These all are the things that makes the Apple’s camera the best in the market like Optical image, stabilization, Six‑element lens, Quad-LED True Tone flash with Slow Sync, Panorama (up to 63MP), Sapphire crystal lens cover, Backside illumination sensor, Hybrid IR filter, Autofocus with Focus Pixels, Tap to focus with Focus Pixels, stabilization of Live Photos with Wide color capture, upgraded local tone mapping, face and body detection, Auto image stabilization, Exposure control, Noise reduction, Auto HDR for photos, Timer mode, Burst mode , Photo geotagging. It also supports the slo-mo(slow motion) video for 1080p at 120 frames per second. The face time HD camera is of 7MP f/2.2 aperture with1080p video recording. The main difference between these 2 models is the camera specifications. This comes with 12 MP wide-angle and telephoto cameras. iPhone comes with f/1.8 aperture for wide angle and f/2.8 aperture for telephoto with digital zoom up to 10X. The above-mentioned things in iPhone 8 are also present in iPhone 8 plus. The added and most important feature in iPhone 8 plus are portrait mode and portrait lightning (still in BETA version). This supports optical zoom with wide color capture for photos and Live Photos. This also comes with QUAD-LED True Tone flash with slow sync. 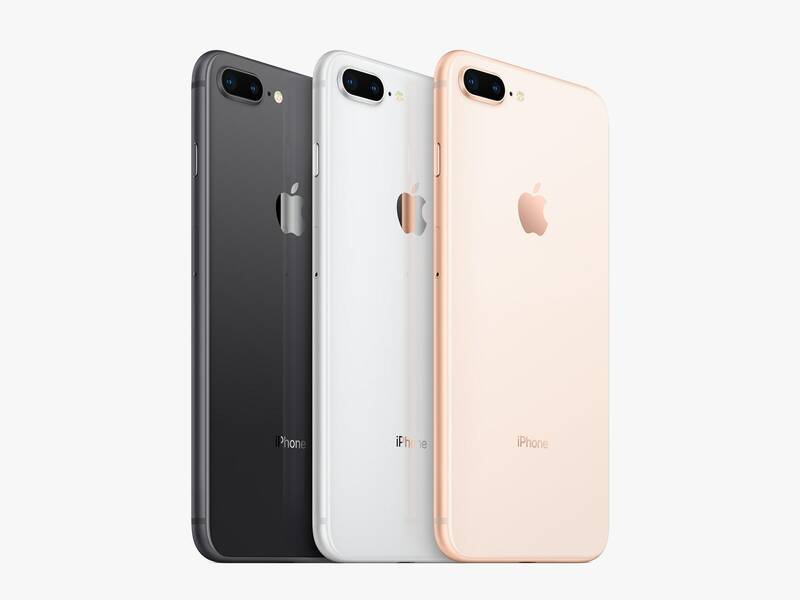 The new iPhone gives battery same as iPhone 7 that is talk time up to 14 hours, internet use up to 12 hours, video playback up to 13 hours, and audio playback up to 40 hours. It supports wireless charging (works with Qi chargers). It is fast charge capable and it can charge up to 50 percent within 30 minutes. The battery life is same as iPhone 7 plus. It has built-in rechargeable lithium-ion battery. It supports wireless charging (works with Qi chargers). iPhone gives talk time (wireless) up to 21 hours, internet use up to 13 hours, video playback up to 14 hours, and audio playback up to 60 hours. It charges up to 50 percent within 30 minutes (fast charge capable). It comes with the following sensors, touch ID fingerprint sensor, Barometer, Three-axis gyro, accelerometer, proximity sensor, ambient light sensor. The phones heart is always its processor which is always invisible to the end-user. Apple proudly announced it’s all new A11 BIONIC processor in iPhone 8 which is the most powerful. It also intelligent chip ever made till now. Out of the 6 cores, 4 cores are efficiency cores that are up to 70 percent faster than A10 FUSION and the rest 2 cores are performance core that is up to 25 percent faster. This core has a controller which provides you with high power when needed without draining the battery soon so that the battery life will be good. The GPU of Apple used is designed with 3 cores which is 30 percent faster than the previous A10 FUSION. Nowadays AR has become a trend but the processor takes a lot of loads when apps supporting AR is used. A11 BIONIC gives great power to the apps supporting the AR. Using the AR apps you can experience the things that are not really present in the place. Like furniture in a room. You can check how the furniture will be looking in a room. You have plenty of other games supporting AR which will take the gaming experience to a new level. As the world is running towards the technology very fast, the next stop is wireless. Apple first released airpods which are wireless earphones then next in this iPhone 8 it released WIRELESS CHARGING which is a big leap. The GLASS design allows the radio transmission to occur from the back panel from the power mats available for charging the phone without any wire. The AIRPOWER MAT is all set for release next year till then the third-party power mats will do the work. If the mats come into the market then charging a phone without wire anywhere will become easy. Most importantly the phone comes with the all-new iOS 11 which is said to be the most advanced and secure operating system in the market with supporting the all new exciting Augmented reality. The new iOS 11 is completely meant for the iPad. The power of this new operating system can be seen when upgraded in iPad. iPhone with latest iOS 11, a 3.5mm headphone jack adapter, lightning to USB cable, EarPods with the lightning connector, USB power adapter, Documentation. iPhone 8 is giving a way for future by its wireless charging. The A11 BIONIC processor with six cores is told to be the powerful and the intelligent processor till date which can work efficiently with augmented reality. Apart from this the iOS 11 plays a major role as the whole experience of the iPhone will be changed by the upgradation of the operating system. The camera experience will be the best as always it has been with iPhone. Apart from the above-mentioned details, there is nothing more different from iPhone 7. As people love to upgrade their iPhones whenever a new iPhone is released, I can say this iPhone 8 will become the default piece from now on. iPhone 8 plus is better in terms of camera specifications than iPhone 8. The whole credit should be given to the silicon team of the Apple who created this monster chip which will be on the top of the list in the market as it comes out.